Published July 2017. 108 pages, colour cover, over 60 black & white illustrations and charts, softbound, and 8 pages of full colour. Tony Clark: The commercial artwork of Fred Steerwood (1888-1965) – our colour section. Prices including postage: Price £12.50, including U.K. postage and packing, £14.50 to Europe including Ireland, £16.50 overseas. 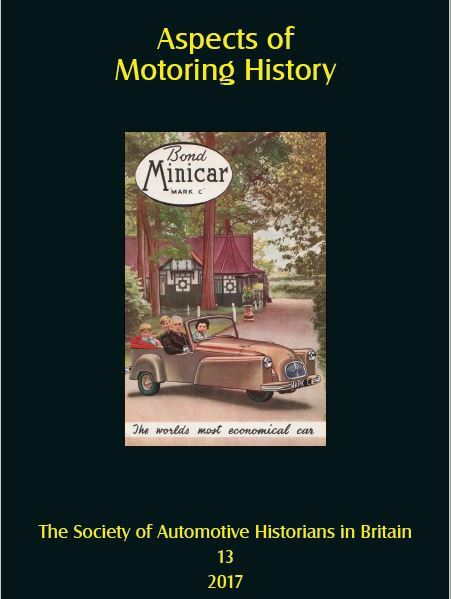 Send a cheque made payable to the Society of Automotive Historians in Britain, and your details, to Aspects of Motoring History, 10 Lodge Park, Whittlebury, Towcester, Northamptonshire, United Kingdom NN12 8XG. If you are overseas and wish to pay by PayPal, please contact peter.moss12@btinternet.com in the first instance, and we’ll organise this for you.